In this show, we begin with a brief discussion of what to do when a therapist doesn’t seem to be a right fit for a family. I received a great question from a mom and addressed it on the show from both a parents’ perspective and a therapists’ position. Listen in for my advice when that happens! 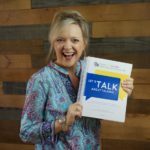 Then the main topic… I’ll walk you through the 4 areas we focus on when working with late talking toddlers using a single activity, water play! Remember – what you’re doing is not that important. You can use this method for ANY toy or everyday activity. If this is your first time hearing me discuss these areas, I explained them in detail in last week’s show. If you’re at home with a child, the easiest way to use this idea is during bath time or the kitchen sink. This activity is perfect for therapists who work in a coaching model. Teach parents this play routine anytime they’re using water at home. For therapists in a clinical setting, get yourself some kind of container to hold the water – so a plastic bin of some kind like this one. I just used this idea during a summer program at my church with a large bucket, so you can really do it anywhere, anytime. The next thing you’ll need is a cloth or sponge. I’ve even done this with a baby wipe playing with a baby doll bathtub – so the routine is super versatile as well. Get the child’s attention by calling his name or getting in his line of vision. Make your facial expressions animated and cheerful to give him a reason to watch you. Then do something with the cloth or sponge – you can put the cloth in the water and swirl it around, or make a big deal about dunking the sponge down in the water – even something like rubbing it together – anything to get the child’s attention. You react to the water falling – especially if the child doesn’t react. Give the child a turn and offer assistance to squeeze the cloth. Be sure to repeat the key word squeeze every time you squeeze the cloth. Many kids begin to imitate the word, but don’t be disappointed if they don’t. Let’s use this same framework to discuss the goals you can target. This game is fantastic for targeting social interaction and engagement with skills like eye contact and joint attention. As the child is watching the water – be sure to put your face in his line of vision. That means if a child is in the tub, you’ll sit down beside the tub so he can see you. When I’m using this in therapy sessions with a container, I’m on the floor too, and I like to get right behind the water as it’s falling so that a child can see me when he’s looking at the water. Use your face and your voice to keep his attention focused on you too. For children with super short attention spans or for those who ignore other people, a big tip is to not give up control of the cloth — you don’t want to get squeezed out of the activity. For those kids, keep the cloth or sponge yourself so that you’re included in the play routine. Remember that attention and participation go hand in hand with social engagement – before we can teach a child anything else. Toddlers must consistently learn to “stay and play” with you as a prerequisite for understanding and using words. If you’re working with a child who is super busy or active and who runs from you or doesn’t stay for more than a few seconds, this is where you need to begin working. This game will help you because the child will be enticed by the water and by you and how fun you are. Once that attention piece is established, this game is a very low pressure way to teach early turn taking – big part of social interaction. For this of course, you will give a child his own turn with the cloth or sponge. Most toddlers will do better using the same cloth as you so that you can establish that nice back and forth. Lead the play routine several times, then offer the child a turn by holding out the cloth. Once he’s played for a few seconds – less than a minute or so, quickly take your own turn – again just a few seconds. Perform the play routine again, then quickly give the cloth to the child for his own turn. Remember here you’re teaching him that I take a turn – you take a turn – which forms the foundation for conversation. 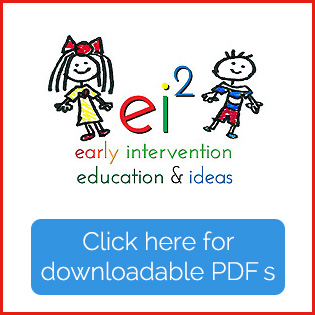 Expressive Language – A big piece of expressive language or learning to talk is teaching a child to imitate. Research tell us that a child’s ability to imitate actions at 18 months is a great predictor of his expressive language at 36 months – so this skill develops before lots of words. This routine is also a super fun way to teach imitation – first with actions then with words. You’ve already modeled some actions like swirling and squeezing – see if a child will try to copy that action you perform. Even splashing in the water is a good idea for teaching imitation! Splash and see if a child will repeat that action. Of course with expressive language we also teach new words. Your obvious target here is the word “squeeze” and I’ve had lots and lots of little friends who were nonverbal or minimally verbal begin to approximate that word during this play routine. Listen carefully for those first few verbal attempts – most of the time it begins when a child makes any kind of vowel sound as you say “squeeze” or at the appropriate time during the routine when it’s their turn. Listen and react with praise and pleasure so that you reinforce every attempt to talk. Be sure you’re modeling the word several times at the appropriate time during the play routine many times BEFORE you expect the child to say the word himself. Syllableness – this means the child includes the correct number of syllables. Obvious targets are multisyllabic words like water, wash cloth or bath cloth. This idea is super, super simple, and again, one that’s consistently a winner when it comes to building attention and participation, social engagement, turn taking, and imitation. 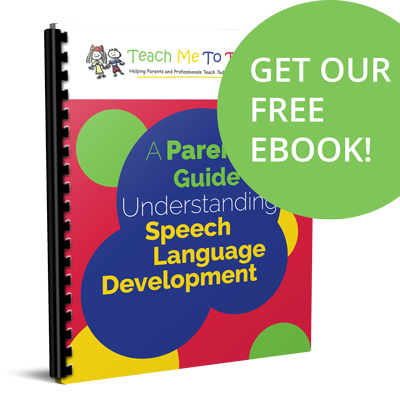 Those skills are all necessary prelinguistic skills – or things a child learns before he begins to talk. If you’d like more ideas for working on these kinds of skills, I can help you with that! Read step-by-step directions for this activity, along with other similar games, it’s included in my therapy manual Let’s Talk About Talking… 11 Skills All Toddlers Master Before Words Emerge. This water play routine is actually one of about 100 or so different activities included throughout the book – perfect for helping late talkers begin to communicate.